tractors or hydraulic shovels for mowing. Applicable to 20- to 50-HP tractors. attached to the rear part of your tractor. Applicable to 50- to 90-HP tractors. 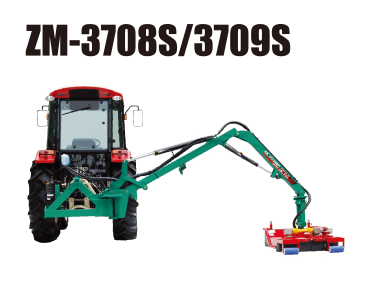 Arm-type (two-side) grass mowers each provided with a three-point link attached to the rear part of your tractor. Applicable to 28- to 50- or 35- to 50-HP tractors. 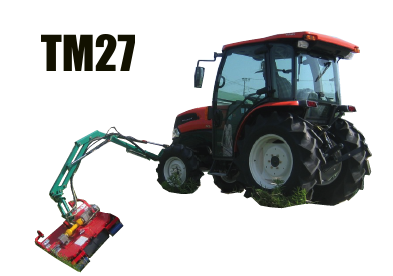 Arm-type grass mowers each provided with a three-point link attached to the rear part of your tractor. Grass mowers each provided with a hydraulic shovel. The Twin Mower plays an active part in the following applications. 1.Mowing on the dikes of paddy fields and other farm fields. 3.Weed cutting in fallow fields. 5.Mowing on farm fields of agricultural schools. 6.Mowing on farm fields of agricultural experiment stations. 12.Mowing on park sites and cycling roads. 13.Processing of asparagus roots and leaves. 14.Processing of plant roots and leaves, such as potato, watermelon, and melon roots and leaves. 15.Processing of residual tobacco plants. 16.Mowing around general housing areas. 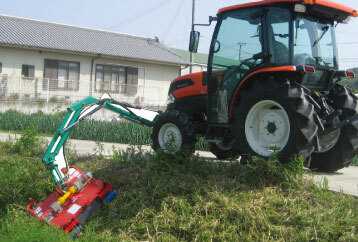 A front-type model used to mow a slope. 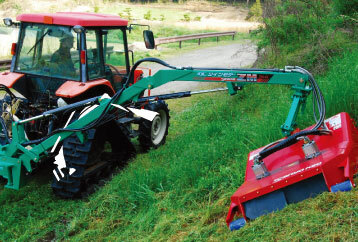 A rear-type model used to mow the slope along a road. 1.The floating link performs floating control according to the undulation of the ground, thus performing work with the cutting height of grass kept even. 3.Connecting to cabin tractors, thus allowing comfortable mowing in the hot summer season. 4.The floating link offers ease of use to anybody regardless of his/her skill level. 5.The models are of arm type, which enables ease of work over guardrails. 6.Four blades in total are provided to the upper and lower tiers, which gather grass finely cut in the center of the mower for ease of grass disposal. 7.Allows mowing both upper and lower sides of slopes. 8.Running at a speed of 2.5 km per hour, thus saving working hours. 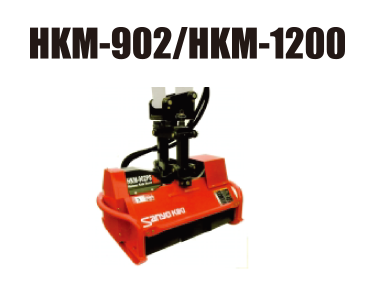 9.Makes it possible to mow slopes, such as dry riverbed slopes, safely. 10.The arms are manually rotated to the left and right, thus making it possible to mow the right- and left-hand sides of the direction of movement. 11.A plane mowing width of 800 mm (ZM-3708 and TM-27) and 900 mm (ZM-3709 and BM-45). 12.Makes it possible to mow the banks on the other sides of irrigation canals. 13.Plants taller than 1 m can be efficiently cut in two steps. 1.Incorporates a magnet-type controller that can be located in desired ease-to-operate positions. 2.If the arm is set on the right-hand side of the driver’s seat, the mowing part will be just beside the driver’s seat, which ensures tireless work for long hours. 3.A lightweight and well-balanced type that ensures safe work on tractors as small as 35 HP in capacity. 4.The ZM-45, ZM-3709, and BM-3708 have maximum work reaches of 4.5, 3.7, and 3.6 m, respectively, thus making it possible to mow remote areas. 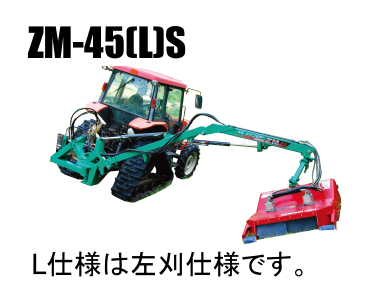 5.Conforming to the auto hitches (S and L hitches) of the Japan Farm Machinery Manufacturer’s Association, thus allowing ease of attachment and detachment. 1.Set on the front part of your tractor and operable in a forward-looking posture, which ensures highly efficient workability. 2.Allows mowing work with the rotary mounted. 3.Operable with a single lever. 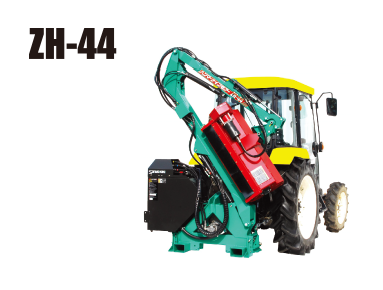 4.A lightweight type that can be mounted to tractors as small as 20 HP in capacity. both upper and lower sides of slopes. 1.Produced in the manufacturer’s factory with ISO9001 certification, which ensures reliability. 2.The body including the cylinder components is finished with baking paint, which ensures corrosion resistance and provides good commodity value with a glossy outlook. 3.Set up with no additional on-site processing. 1.The manufacturer’s office is located in each district, which ensures ease of quick maintenance. 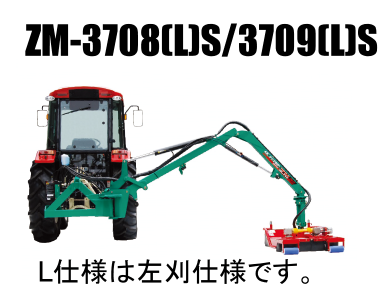 2.Maintenance is performed by Sanyo Kiki dealers and the Japan Agricultural Cooperatives (JA). 3.Blades can be replaced with ease. 4.Rarely fails to operate, thus ensuring ease of maintenance. 1.Makes it possible to mow steep slopes safely. 2.Shock to the mower is double protected by a hydraulic shock absorption valve and a share pin. 3.Provided with a protection cover that prevents stones splashed around. 4.Provided with an eye protector as an accessory to ensure safe work. Protection cover to prevent stones splashed around. 2.Provided with a priority valve to save hydraulic pressure loss. 3.Provided with two blades that can be used economically in rotation. 4.Attached and detached to and from tractors without tools by one person. 5.Mowing other than your own farmland is possible on a contract business basis. 6.No need to be surprised if there is a snake around. 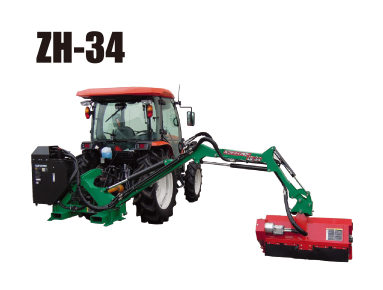 1.Connected to different tractors with the replacement of only small parts, such as hydraulic extraction and power supply extraction. Attached and detached with ease without tools.